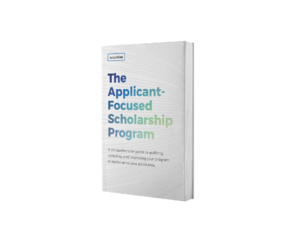 Download Our "The Applicant-Focused Scholarship Program" E-Book! I f you offer a scholarship, its inevitable that the reason you do is to support and help deserving students. Yet so many application processes for such scholarships do quite the opposite. Fill out the form to receive your copy of The Applicant-Focused Scholarship Program. Copyright © 2018 WizeHive, Inc. All rights reserved.